Tony Cummings quizzed BOSH frontman Dave Griffiths about the band's slow but sure move to bigger things. Bournemouth rock band Bosh have slowly but surely risen to prominence so that in the South and West their popularity is on a par with the best known UK acts. Intriguingly, the band have managed to clock up 11 years of gigging and in the process found a sizeable grassroots following. Not only that, the band have made a steady stream of recordings which though in the early years were decidedly rough-and-ready "works in progress" cassettes offer a unique record of a band's laborious pursuit of an individualistic style. As can be heard on Bosh's latest live CD 'Middle Of Somewhere', the group have now found that authoritative stylistic niche - an artful blend of anthemic pop rock and more complex progressive leanings - and seem together with bright new signing [dweeb] ready to made a national dent when pioneering independent label Risen Records announce their Christian retail distribution arrangements. 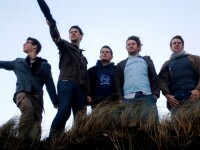 The core of Bosh are two brothers, singer and guitarist David Griffiths and drummer Michael. As children they began experimenting with various instruments. Dave Griffiths explained those groping early efforts. "Bosh began as three children in a shed in the summer of 1996. Our Dad and his band had built a small studio in this shed and my brother Mike, sister Amy and I went in and recorded a little tune of mine called 'Blabbermouth'. We called ourselves Bosh and played the tape to everyone! It's kind of hard to believe that we're still going!" Dave went on to speak about Bosh's early cassette releases. "'Excuse Me, We're Starting' and 'High/Deep/Blue' were two C90 tapes full of musical sketches that Mike and I recorded on various borrowed bits of recording equipment in 1998. Most of it was instrumental, but we were experimenting with sound and with writing and singing songs. Ah, the good old tascam four track - with only three tracks working! I'd be very embarrassed is people heard this early stuff. 'Revolution' was recorded throughout 1999 and into the first few months of 2000. There were four other musicians involved at this point, all from our school. We were beginning to play live and trying to emulate our heroes like Blur and Pink Floyd. 'Something More' and 'Seeking Wonder' were made in 2000 and 2001. Our line-up had settled to three of us, Mike and I and Mark Tompkins, on guitar. These two were on CD as we had recorded the sessions on my treasured digital eight-track I'd slaved all summer for. We were still involving a lot of instrumental pieces and writing around faith themes for the first time. In 2003, the three of us went to a recording studio and made 'Looking Up'. It was a considerable step up from all our home recording 'collections'. Shortly after we finished it James Grant joined us on bass and we started playing live a lot more." Dave continued with the band history. "Mark left after about five and was replaced by Matt Gainsford. Grant Howard joined in time for the sessions for our CD 'VII' in late 2004. 'VII' was our seventh collection of songs and our first with a full, steady line-up. At this point we joined Risen Records and released 'VII' in July 2005. It was a lot of fun to record, which we did in various houses in Bournemouth and Somerset. There was a great sense of team which stood us in good stead for the many gigs that followed." 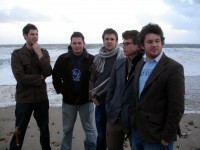 By the time 'VII' was released Dave, with some kindred souls, had founded Bournemouth based Nth Degree, a community of Christians involved in music. Nth Degree has now established the Nth Festival, the largest indoor one day Christian music festival in the UK. Held in Yeovil, Somerset the event in 2006 offered a bill of 20 plus acts including Paul Oakley, Electralyte, Ishmael United and The Plymouths while in 2007 the line up included [dweeb], The Burn Band, Four Kornerz and Verra Cruz while both fests have given a much needed first festival gig to many up-and-coming acts. Dave spoke about the whole Nth Degree ethos. "The whole thing is about bringing musicians in the body of Christ together, uniting to affect culture and society through Kingdom music. Nth Degree grew out of Bournemouth very quickly and now is pretty much a national network. Nth Fest came about when key people in the Nth Community got together and said, 'Why not do a festival.' There were, and are, more than enough artists in the community to fill a good few hours on a couple of stages, so we did, and invited others. The festival is a good introduction to the Nth Community. It's great to be standing alongside others, destroying rivalry and promoting Kingdom values, preferring one-another in love and seeking God together. It feels like we're part of a great movement of Jesus-obsessed artists working away all over the UK." Dave spoke about the decision for Bosh to record a live CD. "We had feedback from friends that the experience and sound of Bosh live was a bit different to the records. The natural step was to remedy that by recording a fair few performances throughout '04,'05 and '06 for a live project. In the end, we found that we had improved so vastly over that period that the best idea would be to tape one gig and mix it. We recorded a performance at one of our favourite places, Infusion in Yeovil on the Middle Of Somewhere Tour late last year. It also happened to be the 100th Bosh performance so it's quite special. A funny story is that the Infusion team thought it'd be nice to set off a load of party poppers and balloons to celebrate our landmark gig. Of course, being a live recording the bangs and pops could be picked up by the mics. I couldn't believe it and, slightly peaved, told them what I thought on the mic. Of course, that bit and lots of popping is edited out of the final mix! Anyway, the end result is a fairly good representation of what we're like on-stage. It was also nice to improve on the studio recordings." Already Bosh is beginning to focus on its 2008 album. Said Dave, "We're cooking up something that we are VERY excited about. We have been putting off releasing the next studio album until we know we have the ways and means to make it spot-on. More than that, we know that this next one will be the reason we were ever a band in the first place. We are going to press 10,000 copies and give them all away. God has clearly spoken to us about reaching those who don't know him yet through our music. Giving so many away seems mad to some people, but we know it's right. People won't have to pay to hear the truth that is in the songs. The themes will be very challenging to people, asking some hard questions, but proclaiming that there IS an answer. It'll be a challenging, but very uplifting record. We are going into the studio in April to start sessions and we'll be working with some excellent people to make the best possible record. It's just such an amazing time in the Bosh camp, the whole vision is being expanded and we're hungry for it!" This is really exciting stuff, the faith and trust BOSH have as God leads you is so inspiring! keep going...looking forward to hearing where God's going to take you next. Oh dear, james if that is you in hampshire i will be very upset. check out our label mates brother john and dweeb, they are incredible bands with great heart. bosh are as BIG as any secular alternative and i hope that themselves and dweeb and the risen records entrepeneurs get the exposure to the world they deserve. truly the God of heaven is at work here. may these humble people be lifted up. Bosh - with probably one of the best male vocals I've heard, along side one of the most creative lead guitarists I've heard in a long time, these guys are definately worth checking out. When you hear them on record, they are great, but it's when they play live you realise that these guys are not just amazingly talented they are seriously into God but in a very credible way.